Louis Moore Bacon is one of the top hedge fund investors still making sizable bets on stocks, bonds, currencies and commodities by employing global macro strategies. 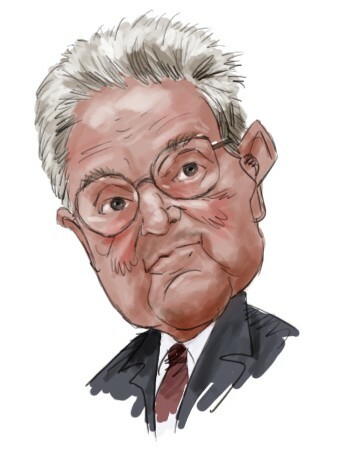 But let’s not forget about George Soros, who is considered by many to be the godfather of macro trading. On the surface, it appears that these two billionaires and their strategies stand greatly apart from each other, but some of their macro bets could make you believe that they have worked shoulder-to-shoulder for many years. Both elite investors placed large bets on the same stocks during the second quarter. This article will discuss four tech stocks that were held in common by the two billionaires and should not be missed. Let’s kick off our discussion by looking at George Soros and Louis Bacon’s positions in Alibaba Group Holding Ltd (NYSE:BABA). Soros Fund Management held a 59,320-share stake in the Chinese tech giant on June 30, a mere fraction of the 4.44 million shares it reported at the end of the first quarter. Similarly, Moore Capital Management also slashed its stake in Alibaba during the second quarter, to 290,000 shares from nearly 2.13 million shares. The shares of the largest e-commerce operator in China have had a rough year thus far, losing more than 37% year-to-date. China’s economic slowdown has surely impacted the company’s activities, so Alibaba Group Holding Ltd (NYSE:BABA) is seeking to expand its operations in the United States and Europe. Just recently, the company announced its plans to open offices in France, Italy, and Germany so as to inject new dynamism into its growth potential. Rob Citrone’s Discovery Capital Management represents the largest equity holder of Alibaba Group Holding Ltd (NYSE:BABA) within our database, owning 6.52 million shares as of June 30. It appears that George Soros and Louis Bacon share the same thoughts on Baidu Inc. (ADR) (NASDAQ:BIDU) as well, given that both billionaires reduced their holdings in the stock during the second quarter. Soros’ family office reported owning 42,800 shares of the Chinese-language Internet search provider as of the end of the second quarter, compared with 358,650 it previously reported holding as of March 31. Meanwhile, Moore Capital Management reduced its stake in Baidu Inc. (ADR) (NASDAQ:BIDU) to 273,000 shares from 319,689 shares during the second quarter. Baidu’s stock has not performed much better than other China-related stocks, dropping by nearly 36% since the beginning of the year. There are no doubts that the weakening business conditions in China have put significant downward pressure on the stock and its operations, but many tend to believe that the company has a bright future. Baidu’s advertising business has more room for growth, considering that only a small portion of the Chinese small and medium-sized companies are present on its platform. Scopia Capital, founded by Matt Sirovich and Jeremy Mindich, reported an ownership stake of 1.86 million shares in Baidu Inc. (ADR) (NASDAQ:BIDU) in its latest 13F filing. Did Soros and Bacon shares the same thoughts on their other prominent tech picks? Head to the next page to find out. Sequenom, Aclaris, and Xenoport Making Waves Among Elite Healthcare Investors... Why Did These Stocks Move Higher On Tuesday And Should You Follow The Crowd... Orexigen Therapeutics Inc. (OREX) and Spectranetics Corp (SPNC): Billionaires... These Three Stocks Are on the Move for Different Reasons; What Does Smart Money... Billionaire Seth Klarman’s Top Five Positions Revisited Why Are Stocks of Brazilian Companies Struggling Today?